SINGAPORE, 16 August 2018 – From now till 31 August 2018, receive up to two complimentary units of TP-Link Deco M5 Mesh Router (cover up to 3,000 sqft) when you subscribe to any 1Gbps Mesh Wi-Fi Plan or one complimentary unit of TP-Link Archer AC1200 Wireless Router when you sign up for any 1Gbps Wireless Router Plan. On top of that, get FREE up to $50 NTUC vouchers for any subscription! Free 12 months subscription to ESET NOD32® Antivirus (Windows) OR mobile security (Android), worth up to $29.90. 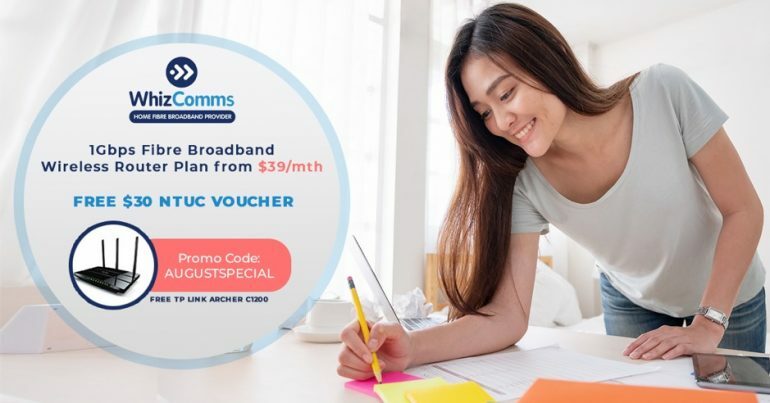 For more information, customers may visit WhizComms’ website at https://www.whizcomms.com.sg/promotions/augustspecial/ and subscribe with Promo Code <AUGUSTSPECIAL> to enjoy the promotion. Promotion ends 31 August 2018.